Art Malm is a member of Engineers Without Borders USA. He is also a resident of Elgin, IL and Democratic Precinct Committeeman for Elgin Township Precinct 40. Below is a letter he sent to Rachel Maddow outlining his findings regarding the while touring Puerto Rico to help assess the conditions there. Your pledge to follow the story of hurricanes Irma and Maria in Puerto Rico inspired me. Here is a report on what two engineers saw when visiting the island this week. Today this report seems so much more timely as we have just heard the Trump Tax bill will further devastate this island’s economy with a 20% excise tax on all goods shipped from Puerto Rico to the mainland. Dr. Reid and I are in San Juan tonight, just completing a seven day 750 mile tour of Puerto Rico. This is a personal tour by both of us done in part to assess the status of the island’s water and electric power. Both of us have been disturbed by the lack of credible technical information coming from the Island. We simply decided to see for ourselves. This is my report to you and your viewers. Dr. Reid’s own first report can be viewed here. At the outset, the public water supply issues in Puerto Rico have been in most cases a direct result of electric power failures. The potential for a public health crisis today appears greatly diminished. There is certainly a story to tell about water here in Puerto Rico but I’ll defer for now. Electric power, or rather the lack of it is, or perhaps now was, the major story. Statistics provided at Status.pr are HUGELY misleading. Tonight this site is reporting electrical generation is at 68.4%. It is easy enough to assume that means 68.% of Puerto Ricans have electric power. Nothing could be further from the truth. The Puerto Rico electric power authority might be able to generate 68% of what they could before the storm, but they cannot deliver that electricity yet to most of their customers. Electric power lines are down almost everywhere we traveled on the island and repair crews are few and far between. The gravity of the electric power crisis cannot be overstated. Lack of electric power in Puerto Rico is an economic catastrophe. In our roughly 750 miles of travels from San Juan into the mountains and along the coasts we did not see a single small town with grid electrical service. Resort cities such as Arecibo and Humacao have no power to their central business districts. The central business districts in these cities and many others are effectively ghost towns. The only power we have seen evidence of comes from those few businesses with standby generators. Many of the businesses even in Old San Juan are without power and shuttered. Here is a water analogy that some might find helpful: The statistic Status.PR is reporting is akin to saying ‘my pumps can pump a million gallons of water a day’ but failing to state ‘ but since almost all of the pipes in town are broken none of the water can reach my customers.’ Or alternatively, a restaurant owner saying ‘our kitchen can feed dinner to 1,000 people but only having tables for 50’. Far fewer than 10% of the traffic lights that we passed on the island this week are operating. Roadsides everywhere in both urban areas and deep in the mountains are lined with broken power poles and piles of electric and communication cables. The streets and roadways are remarkably clean. Great windrows of trees and rubbish along side the roads attest to the extraordinary amount of work done by the Puerto Rican people to date. The stories of whole communities being isolated for weeks by fallen trees, landslides and washed out bridges are in evidence everywhere. The recovery work in the transportation sector has been remarkable but certainly not complete. In contrast power lines are still down and laying off to the side of the roadways almost everywhere, now over 70 days since Maria struck. Nowhere did we see the needed army of electric utility workers. The humanitarian tragedy created by the loss of electric power for our fellow American citizens in Puerto Rico is huge. Speaking with wait staffs, Uber drivers, folks behind store counters and the Puerto Rican volunteers who have guided us as part of their own humanitarian response, most are still living without electric power at all. Some haven’t had power since Irma struck. A few are fortunate enough to have a small generator and the $15 a day in fuel to keep their refrigerator cold, some lights on at night and a fan for sleeping. One of our waitresses lives on the 14th floor of an apartment building in San Juan just got her power back this week. Families we delivered water filters and small solar batteries to in the rural mountain community of Careterra have been told not to expect power to return for a year and a half. Waitresses at one of the few restaurants open in Old San Juan tonight told us 40% of the businesses in that popular tourist area are expected to close permanently. Without paychecks for over two months many workers are now facing eviction by their landlords. Of course the whole story about the current economic calamity this island faces isn’t electrical power. Beaches are clean, and that’s a good thing. But we visited the El Yunque National Forest, a key tourist destination in eastern Puerto Rico. El Yunque is closed and we were told will not open for another 12 months until crews can clear the fallen trees and stabilize areas subject to landslides. 12 months closure of El Yunque means 12 months without work for the many tour guides and business establishments whose lifeblood is that forest. El Yunque needs a much larger army of chainsaws. And now we hear the Republican tax bill is going to place a 20% excise tax on goods leaving Puerto Rico for the mainland? That is putting a knife in the back of every man, woman and child on this island as they struggle to overcome the twin blows of Irma and Marie. Unconscionable, but then are there any R’s left with a conscience? Thank you for all you do and your consideration in bringing this important story to your audience. Many government sites are being changed rapidly and in dangerous ways. Entire critical sections of information are being removed. Luckily the Internet Archive’s Wayback Machine is there to help us maintain vital pieces of information. They have now released a Chrome browser extension to make finding the information that is missing from pages. 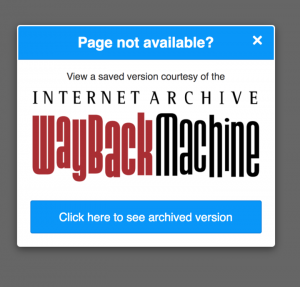 The Wayback Machine Chrome browser extension helps make the web more reliable by detecting dead web pages and offering to replay archived versions of them. I just returned from the Florida panhandle. The beach is sugar white sand, the water a stunning turquoise. The Louisiana oysters large and delicious. I remembered how harshly President Obama was criticized for his “mishandling” of the massive Gulf oil spill disaster. Our country is free of Ebola without any fatalities from infection on American shores. Remember how the president was condemned for “having no Ebola control strategy”? Unemployment is under 6 percent. Remember how Obama’s economic policies would certainly throw our nation into a deep depression? How many times have we heard how Obama would nationalize our auto industry, take away our guns and how our nation’s annual deficit would continue unabated at $1.7 trillion for decades to come? I could go on, but you catch my drift. If conservatives went to Vegas and placed bets on everything they predicted about President Obama and his policies they’d have been bankrupt long ago, no matter how much money the Koch brothers stuffed into their pockets along the way. The Obamacare website was up and running soon enough last year to exceed its subscription projections. Our nation’s economy was certain to be crushed by Obamacare according to almost every Republican. Check out the S&P growth since 2009 or 2013. Didn’t happen. Rather than its destruction, the American health care system has been one of the very best sectors for investors over the past two years. We need to start paying attention and track what was predicted by who and when and whether they were right or wrong. Only then should we form our opinions and vote. That being said, any Democratic candidate who ran away from the president in this past election cycle didn’t deserve to win.